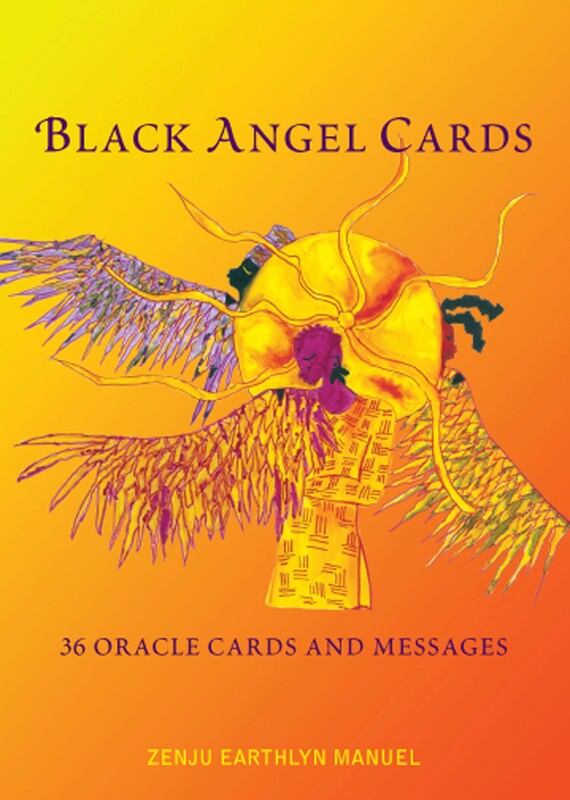 The Black Angel Cards serve as an oracle and way to inspire and affirm, to access your own intuitive nature and guide you in unfolding the true essence of your life. A black angel is the essence, the symbol of clear seeing inside the mysterious darkness of our lives. It is an ancient symbol of sacred darkness filled with light and wisdom. She is within all of us. Both the oracle of 36 illustrated deck of cards and accompanying book of messages came in a lucid dream to Zenju Earthlyn Manuel. She understood them as a response to her own prayer and meditation to reveal her true nature. Therefore, the dream symbols such as The Braider, The Mother Soul, The Drummer, The Moon Child, surface a profound sense of inner beauty and worthiness for those who want to walk in wellness. They have been used by psychotherapists, life coaches, diviners, educators, workshop and group facilitators, and with family and friends.